Is Thor Equities defunct Flea by the Sea about to become Aqueduct by the Sea? The City’s and Central Amusement International’s new Scream Zone amusement park may be getting a flea market as a next-door neighbor. The buzz in Coney Island is that the vendors from the displaced Aqueduct Flea Market are prepared to lease Thor’s Stillwell Avenue lots, which are adjacent to the City-owned land. 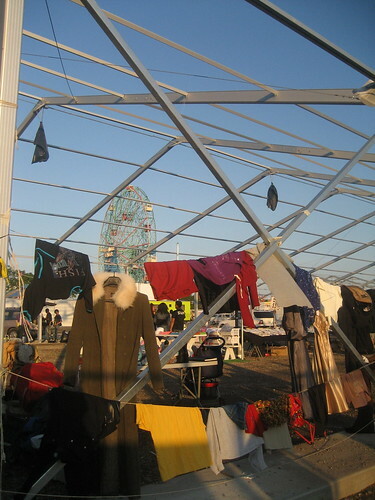 The tent frames from 2009’s Flea by the Sea remain standing, though the lots were vacant last season. If all goes smoothly with the process of securing permits from the City, vendors from the City’s largest flea market may set up their wares on property next to the new high thrill rides. Um, so was this part of the Coney Island Development Corporation’s Strategic Plan? Is shopping at a flea by the sea what the city planner really meant by “entertainment retail”? Since ATZ first reported the news in “Displaced Queens Flea Vendors Eye Coney Island’s Vacant Lots” (ATZ, December 20, 2010), nobody has followed up on the story. But Queens vendors who are coming to check out the Coney Island location helped keep the story alive for me. I figured the rumored deal would fall through due to high rent and onerous lease terms. Hey, maybe it will still fall through! Last May, Tennessee-based Universal Fairs plan to lease Thor’s lots for an amusement park fell through for those very reasons. The flea management is currently working to secure the permits. To be clear, it is not the operator of the Aqueduct Flea Market, but individuals who helped manage the flea market and know how to run such a business, who are trying to put together the deal. Coney Island hasn’t seen a flea market since 2009, when Thor Equities inflicted Festival by the Sea aka Flea by the Sea on Stillwell Avenue. 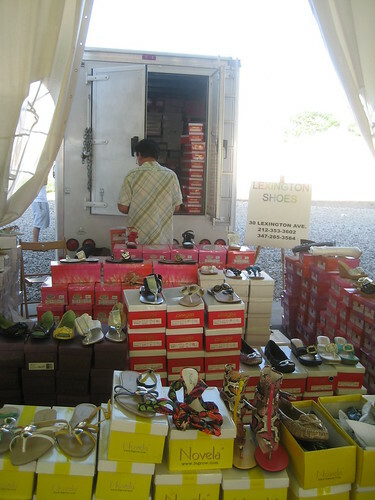 The flea market featured an array of incongruous items and was a spectacular flop. Just look at my Flea by the Sea flickr set –automotive supplies, bathtub remodeling, shoes galore at anchor store #7. Yeah, they had cheap sunglasses, cellphone cases, T-shirts and beach towels, too. At Thor’s flea market, I felt really sad walking on the hallowed ground where amusements had existed for more than 100 years until Joe Sitt bought the property and bulldozed everything. Stillwell Avenue, where the Tornado Roller coaster (1927-1977), the Bobsled (1941-1974), and Stauch’s Baths and Dance Hall (1930-1998) once stood, where Norman Kaufman’s Batting Range and Go Kart City amused the zillion until Joe Sitt emptied out the amusements. This is not the place for a flea market. Some people would say to me, well it’s better than an empty lot. I can’t agree. Sadly, many amusement operators tried but failed to rent the property from Thor. I always felt the gi-normous enclosed tents were part of Thor Equities strategy to win a variance for 10,000 square foot retail from the next administration. The City made a huge mistake not to have driven a better bargain with Joe Sitt and bought all of Stillwell instead of merely half of it. ATZ learned that event organizer Will McCarthy, who already applied for a Temporary Place of Assembly Permit for the market from the DOB, will meet with City officials on Thursday in hopes of speeding along necessary approvals from the FDNY and DEP. Sources say a meeting with the Brooklyn Borough President to discuss the “BK Festival’s” plans is also on this week’s schedule. 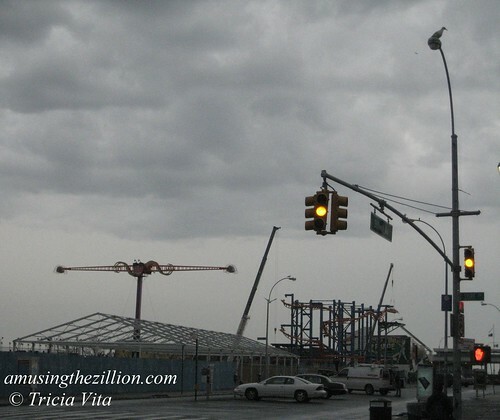 Read more at “Thor’s Coney Island: Joe Sitt Scores Puff Piece in NY Times,” ATZ, April 5, 2011. Aqueduct got rid of the flea’s. Why?? I was in Florida 2 yrs. ago (South Beach). Hotels and building’s in a line blocking the beach, all nice and privatized and inbetween all that were a couple of Flea Markets! Get the picture. The flea market was displaced because Aqueduct Racetrack is getting an upscale redo as a casino with more than 4,500 video slots, restaurants, etc. The casino is run by Genting, a Malaysian company that paid a multi-million dollar licensing fee to NY state and will generate huge tax revenues for the state. According to news reports, Queens politicians and community leaders promised to help the Aqueduct flea’s estimated 1,000-plus vendors relocate, but no place could be found that was big enough or zoned for a flea market. Since then some vendors have found spots at other flea markets in NYC and NJ. Please send me any messages about flea market like was in aqueduct place,many peoples need that business for shoping.We love flea market like aqueduct place was.Miro. I'm a professional writer and social media manager. Visit my website for details. Amusing the Zillion is my personal blog. The content and ideas expressed here are uniquely my own. © Tricia Vita and Amusing the Zillion 2009-2019. Unauthorized use and/or duplication of material including photos and republication of RSS feed without express and written permission from this blog’s owner is strictly prohibited. Brief excerpts and links may be used, provided that full and clear credit is given to Tricia Vita and Amusing the Zillion with appropriate and specific links to the original content. Follow us on twitter for breaking news, event listings & frivolities! © Tricia Vita and Amusing the Zillion, 2009-2019. Unauthorized use and/or duplication of material including photos and republication of RSS feed without express and written permission from this blog’s owner is strictly prohibited. Brief excerpts and links may be used, provided that full and clear credit is given to Tricia Vita and Amusing the Zillion with appropriate and specific links to the original content.